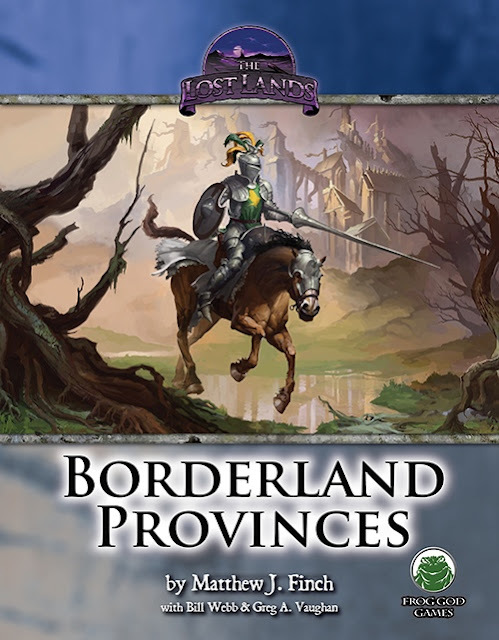 The Lost Lands: Borderland Provinces Kickstarter has been picking up speed in it's final days and now it's in it's final hours. I posted about it earlier here and I'm not going to go into full details a second time, but Frog God is putting out a campaign setting for their adventures and you can get in for as little as $35 in print for the campaign OR adventure book, $70 if you want both. It comes in Pathfinder, 5e and Swords & Wizardry flavors. It's hit a number of stretch goals. I'm just going to highlight the ones that add more content. $46,000 Walls of Broch Tarna: Free short-story fiction, set in the Borderlands. “The Walls of Broch Tarna” by Nathan Shank. $48,000 Alternative Wilderness Tables (Basic tables): Region-Level Wilderness Encounter Tables as further described below. $50,000 Stretch Goal #3: Perilous Places #1. Specific encounter tables for those foolhardy enough to venture into the Forest of Hope or (even worse) the Creeping Mire in Keston Province. $52,000 Stretch Goal #4: Gods of the Borderland Provinces (Basic)! Pages added to the book, describing the most prominent of the region's deities. $54,000 Stretch Goal #6: Perilous Places #2: Specific encounter tables for the Lorremach Highhills, the Wilderland Hills, and the Duskmoon Hills. $56,000 Stretch Goal #8: Archeillus. The basic form of the deities appendix will contain the descriptions of Thyr, Freya, Muir, and Belon the Wise. If we unlock this stretch goal, the less-known god Archeillus is added to the appendix of Borderland deities. $57,000 Stretch Goal #9: Yenomesh. Yenomesh is the god of glyphs and writing, and appears to be responsible for a miracle that happened in one of the towns of Suilley. He’s a good patron for wizards. $59,000 Stretch Goal #11: Perilous Places #3. Specific encounter tables for the Forlorn Mountains, the Kal’Iugus Mountains, the Meridian Range, the Rampart Mountains, and the eerie peaks of the Cretians. $60,000 Stretch Goal #12: Telophus. Telophus is a very commonly worshipped deity among the peasantry, a god of farming and grain. His church is becoming more active in the face of the oppression of farmers in some parts of the Borderlands, and would be an excellent patron for clerics who like to go around rescuing settlements on the edge of the wilderness. $62,000 Stretch Goal #13: Free adventure PDF “Vindication.” If we hit this stretch goal, we will give a free pdf of the Borderland Provinces d20 adventure Vindication to all backers. Vindication is not converted from the original d20 format, so it would require a bit of work to use it directly, but it provides tons of information about the Lorremach Highhills. It’s a very useful resource. Lots of good stuff added already and some very attractive free PDFs potentially to be added in the next few hours. If you haven't checked out The Lost Lands: Borderland Provinces Kickstarter, your time is running out. Frog God does some extremely high quality releases and this looks to be up there with their previous ones.